It's no secret that celebrities have a powerful influence on society. The explosion of social media has only further increased this influence by allowing celebrities to get their message out whenever they please and on their own terms. On December 3rd, at 8pm EST, rapper and hip hop mogul Jay-Z posted an article on his Life + Times website announcing that he was going vegan, and that he was doing it with 22 Days Nutrition. 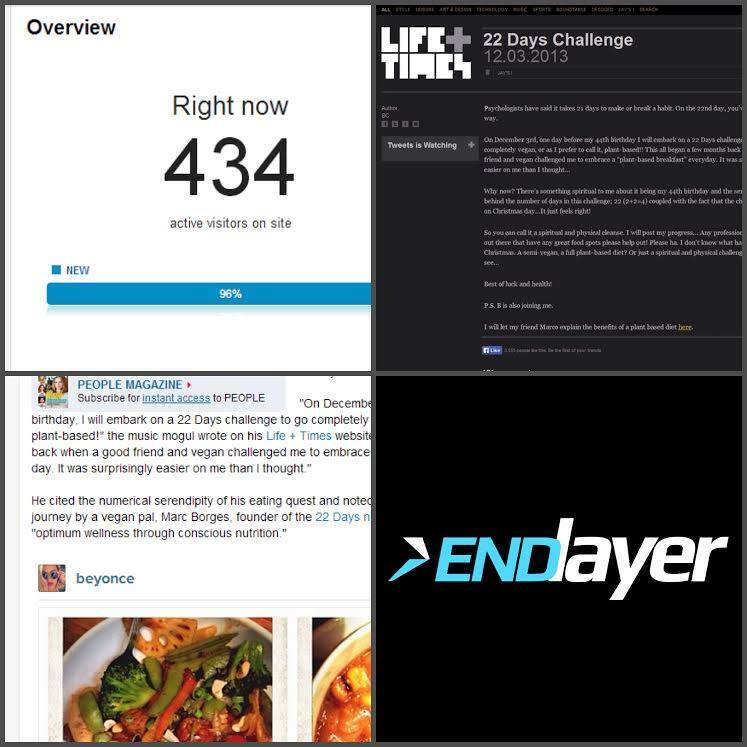 22 Days Nutrition, a longtime client of EndLayer, alerted us of a likely traffic spike. ...and then it came. 1,000's and 1,000's of visitors landed on the 22 Days Nutrition website simultaneously. All throughout the night the vegan world exploded, as did celebrity news sources, magazines and media outlets. As our engineers monitored the server's performance and stability, the management team overseeing the operation took a few minutes to sit back and watch the media continue running with the story that was bringing our client tons and tons of traffic. Media outlets weren't the only ones chiming in either. Traffic was coming from everywhere. With each and every media mention, the traffic continued to explode. As U.S. traffic died down Tuesday night, international traffic was on the rise. Throughout this explosion at no point in time was 22DaysNutrition.com offline, or faced with performance issues of any kind. As Wednesday went on, more and more traffic continued to pound the website. Unlike a normal celebrity mention, the media went crazy with this story and the origins - 22 Days Nutrition. Everyone from the LA Times and Huffington Post, to TMZ and Perez Hilton were sharing and curating content on Jay-Z and Beyonce's decision to go vegan for 22 days as a direct result of the influence of Marco Borges and 22 Days Nutrition. With the large amounts of publicity 22 Days Nutrition was receiving, it was more important than ever to ensure that all of these new visitors who came to learn about 22 Days Nutrition were not going to have their first impression derailed by website issues. Website issues ranging from slow performance and instability, to safety and security can very easily steal a new visitors first impression and make it a bad one. There's never an excuse not to ensure that your website is performing at the highest level possible, and to ensure this peace of mind, 22 Days Nutrition relies on EndLayer for all of their high-end managed hosting needs. We can't wait to see what happens next as the 22 Days brand continues to grow!